Shakespeare *himself* just invaded the RSC stage in outrage at BP sponsorship – BP or not BP? Posted on April 27, 2017 April 29, 2017 by BP or not BP? Tonight, the performance of Antony and Cleopatra in the Royal Shakespeare Theatre had an unexpected warm-up act, when two performers took the stage without permission a few minutes before the play was due to start. The first performer pretended to be a spokesperson for the RSC’s sponsor BP, but his cringeworthy PR-speak was suddenly interrupted by a furious William Shakespeare. The full script can be found below. The rebel actors – from the activist theatre troupe “BP or not BP?” – were there to highlight the hypocrisy of BP sponsoring the RSC’s £5 ticket scheme for young people, while the company is destroying those young people’s futures. BP is one of the world’s most polluting companies, actively lobbying to block climate action and continue extracting fossil fuels way beyond levels that are safe for the climate. The RSC receives less than 0.5% of its annual income from BP, and last year made a £4.6 million surplus. The group had originally attempted this disobedient performance on press night in March, but were prevented by RSC staff. This time, however, the performers managed to reach the stage, complete the performance, and walk away freely. BP’s association with a play set in Egypt is of particular concern to the activists, who point to BP’s recent $12bn dollar gas extraction deal with Egypt’s brutal Sisi regime. Protests in Idku in the Nile Delta in 2011-2012 pushed BP to freeze construction of a gas terminal for over a year, but under the current regime of Abdel Fattah El-Sisi, opposition has been quashed with the introduction of a repressive anti-protest law and BP’s plans have been steamrolled through. The actor-vists purposefully chose not to interrupt the performance itself, out of respect for RSC actors and staff who have been given no say over the BP sponsorship, and for the audience, whom they thanked at the end of their performance and encouraged to enjoy Iqbal Khan’s extraordinary production. The RSC’s sponsorship by BP is already under fire from leading figures in the theatre world. Oscar-winning actor and RSC Associate Artist Sir Mark Rylance has vowed not to work with the company until it drops BP. Over 200 cultural figures, scientists, academics, politicians, climate campaigners and representatives of communities affected by BP’s activities all signed a letter to the Times condemning the new 5-year sponsorship deal when it was announced last July. This is the seventh time BP or not BP? 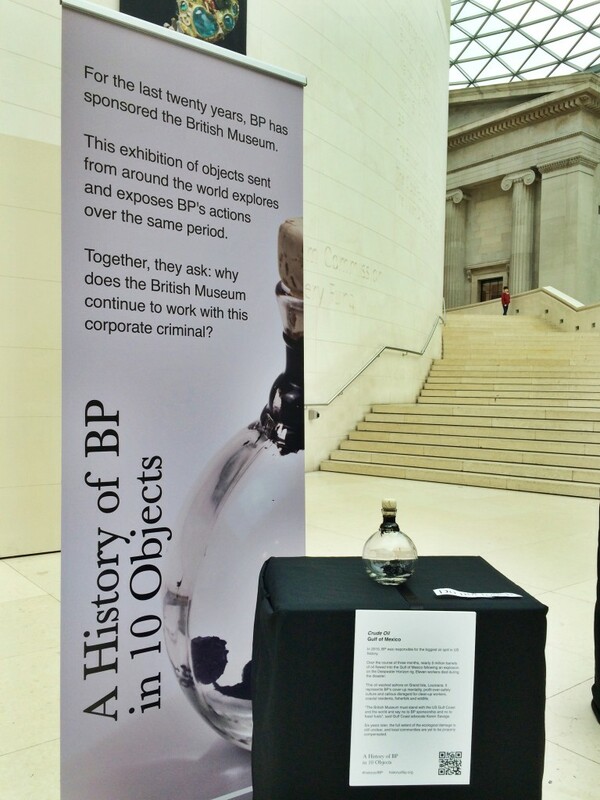 has invaded the stage at an RSC performance, with a Shakespeare-inspired intervention about BP. The first six performances took place in 2012, when the RSC was displaying BP logos prominently on its plays as part of the BP-sponsored World Shakespeare Festival. Since then, the RSC’s BP partnership has been much more low profile, until the new 5-year deal was signed last year. Campaigners now intend to ramp up the pressure on the theatre company to cancel the new five-year deal before it comes into force in 2018. Tonight’s stage invasion began with children’s author Darragh Martin giving an eerily convincing performance as Brad Patterson, Art Engagement Liaison for BP, proudly displaying the full-page BP advert in the back of tonight’s programme. After a smarmy attempt to sing BP’s praises and impress the young people in the audience (using words and phrases taken from BP’s real-life PR materials), he claimed ‘I like to think that if Shakespeare were alive today he’d be an oil man: he certainly knows his way around a geopolitical conflict!’. At this point, William Shakespeare himself (played by Phoebe Demeger) leapt onto the stage, firing Elizabethan insults and declaring “I should rather pluck my plays from this earth / Than have oil spill across my legacy”. The two then verbally sparred in iambic pentameter until Shakespeare concludes: ‘Vile you are: Shakespeare will be no dodo! Avaunt! Get off my stage! Out damn logo!’ and ripped the BP logo from the theatre programme, ending the performance. The audience laughed and applauded. Phoebe then stepped out of character to reveal that she is a member of the BP-sponsored £5 ticket scheme and explained that the impacts of climate change are so severe that she felt compelled to act. She encouraged members of the audience who feel the same to rip the BP logo from their programmes and hand it in to RSC staff at the end of the performance. The performers then walked out of the theatre, and will return to talk to the audience and hand out flyers during the interval. Friends, Romans, and countrymen, lend me your ears!! My name is Brad Patterson, Arts Engagement Liaison at BP, and I have the unenviable task of being the warm-up band for Shakespeare: somebody’s got to make the guy sound good!! Seriously, though, I want to take a couple of minutes of your time to share the news about the exciting initiative that BP and the Royal Shakespeare Company are pioneering. Giving is central to the fabric of BP’s brand identity and so we are thrilled to sponsor 5 pounds tickets for 16-25 year olds here at the Oil Shak – oops, I mean the Royal Shakespeare Company. Are there any 16-25 year olds in the audience? Heyyyy!! [dabs] BP are committed to bringing the best of the UK’s culture to a younger audience. We hope this can be the beginning of a beautiful friendship between BP and the next generation of artists, dreamers, and any budding oil men – or women! – in tonight. I like to think that if Shakespeare were alive today he’d be an oil man: he certainly knows his way around a geopolitical conflict! Your wrangling words assault my tender ears. Than have oil spill across my legacy. To wax and worry about the ocean’s rise. Your brave warm world sends the Av’n o’er its banks. To an audience of fish? Oh no! Than fossil fool away our salad days. Your art depended on a patron’s payday. Is we have coins to charm the ferryman. Half a per cent more if it must be so! Have me stoop to catch the change you toss? ‘Tis custom on a stage to trade some jibes! BP’s green-tinged mask conceals a face most foul. BP’s logo is green, we are not so vile! Vile you are: Shakespeare will be no dodo! Avaunt! Get off my stage! Out damn logo!